Memories of a 5 day mountain bike and trekking journey through the 540 million year old Flinders Ranges will stay with you forever. Fill your senses as you cycle along silent, dusty red roads bordered by towering ancient cliffs and deep craters with parrots, yellow-footed rock wallabies, kangaroos and emus as your only companions. Tempt your taste buds with bush tucker. Dine in style from European and Asian style cuisine at the famous Prairie Hotel in Parachilna. 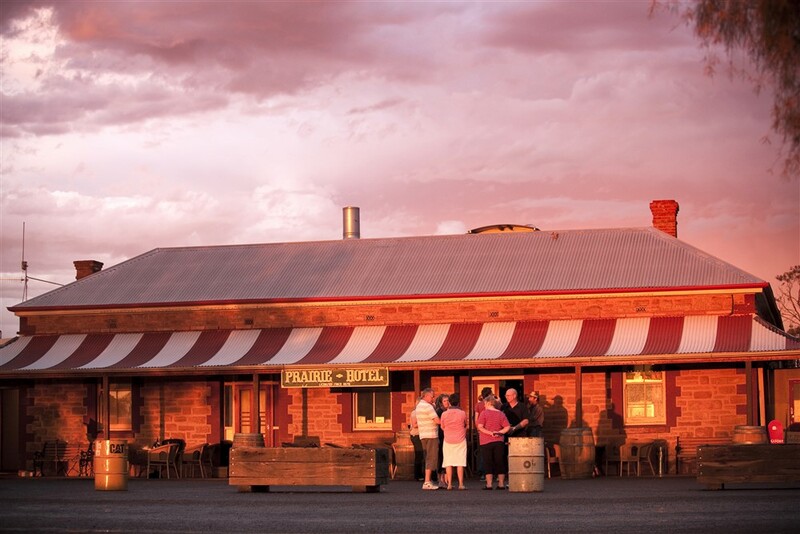 Sample quandong pies in Blinman and wash it down with a glass of famous South Australian wine from Bundaleer Wines - one of the largest producers in the Southern Flinders Ranges. Our staff will meet you at Adelaide Airport and you will be coached from here to our accommodation in the Flinders Ranges. Settle back for the journey which takes us first through rich farmland before we traverse the Southern Flinders before arriving at our destination. After settling in to your accommodation we will organise bikes and take a short mid-afternoon ride before sunset drinks on the Balcony. Our first day takes us to Angorichina Station where we will meet the owner of the property for a guided walking tour of the outbuildings, shearing quarters and sheds on this beautiful Station. A gourmet lunch followed by the chance of an exhilarating scenic flight for those who so desire and the gentle ride home. Tennis in the afternoon followed by dinner tonight at the Blinman Hotel. Another beautiful day, this time heading into the stunning Brachina Gorge for a typical South Australian creek bed barbecue lunch. Afterward the return ride home. Late afternoon trek for those interested before returning to base. Catered sunset dinner on the deck this evening. This morning we cycle out to the "Great Wall." On arrival, some traditional Aussie tea and damper for Morning Tea, then the chance to climb the Great Wall itself. Back to base & Wood Fired Pizza on the deck this evening. The second of our gorges today. This time we head to Blinman before turning west and heading into the Parachilna gorge. Before the gorge we stop at Angorichina Village and do the Blinman Pools Walk. Then on into the gorge, stopping for a creekbed "cuppa" and then pushing on through open country to Parachilna and the famous Prairie Hotel for lunch. Ride home or take the easy way in our transport, Barbecue dinner this evening. Our time here is done and this morning we head Southward with our destination being the South Australian Mountain Biking Mecca of Melrose where we be located for the next two nights. On arrival we will check into our accommodation and you will have some time for lunch and to wander the town. Both days here in Melrose will be "freestyling days" with options available from the sublime to the insane. Take a sedate ride through wheat, barley and canola fields or go for the serious adrenaline rush available on the Mt Remarkable Trails which start right outside your door. One last early morning ride followed by breakfast and our departure for Adelaide where you will be delivered to the Airport for your return flights home.